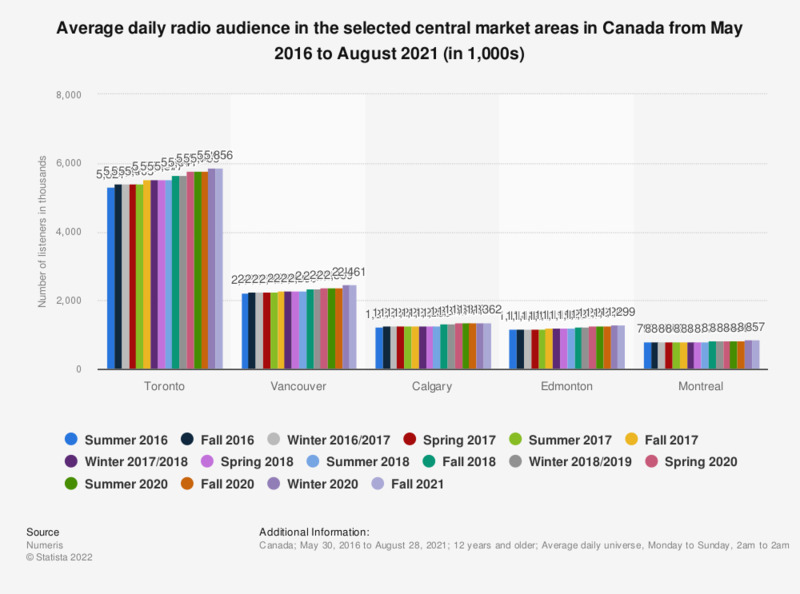 This statistic presents the average daily radio audience in the selected central market areas in Canada from May 2016 to February 2019. According to the source, in the winter of 2018/2019 Toronto radio stations had over 5.64 million listeners, up from just under 5.52 million in the same period of 2017. The figures for markets included in this statistic come from their respective reporting sheets. The source provides the following explanation to the figures: "The universe is expressed as daily averages because it changes slightly daily as the in tab changes." Central (Ctrl) Market Area - A BBM defined geographical area, usually centered around one urban centre. The definition of a Central Market Area generally corresponds to Statistics Canada Census Metropolitan Areas, Census Agglomeration, Cities, Counties.